I received a mail from a US-based filmmaker about a documentary she was working on. According to Alexandra Eaton, her docu-film is a slice of ‘Bombay life’. But for me, it was one of the ‘strangest’ documentaries I had ever come across. When most documentaries in India script success stories or are investigative in nature, this one documented a colossal failure of a filmmaker. Alexandra followed an independent filmmaker in Mumbai as he attempted to put together a commercial film on a very tight budget. Her documentary followed the journey of this filmmaker called Raja Menon as he was fighting against all odds to make the feature film with actors like Vijay Raaz and Naseruddin Shah. Alexandra visited the sets everyday and carefully documented the journey till the release of the film. This film called Barah Aana eventually turned out to be a huge flop. However, Alexandra’s documentary won rave reviews across the world for showcasing the frustration and the insurmountable odds that an independent filmmaker has to go through in Bollywood. Very few people have their failures as well documented as Raja Krishna Menon. When Alexandra got in touch with me to promote her documentary, I asked her to write a blog detailing her experiences of watching a passionate filmmaker bite the dust. She wrote a lovely blog for me where she narrated in detail about how the director raced past all odds to make the film and then lived on to see the film getting wiped out at the box office, like most independent and niche filmmakers in Mumbai’s film industry. 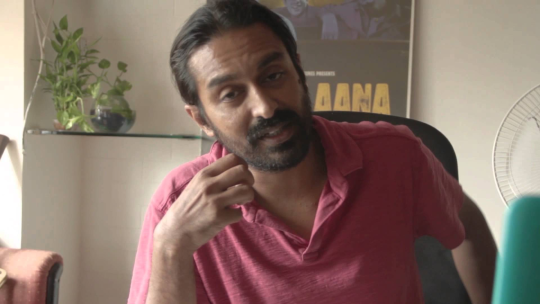 Interestingly, in the documentary Raja Menon is described as “an independent filmmaker living in the shadow of Bollywood”. Here’s the trailer of the documentary. Watch it. I thought that it was the last time I was hearing about Raja Krishna Menon. A few years later the same filmmaker, who was the poster boy of failure, made a comeback. And what a comeback it was! The same filmmaker who was ‘lurking in the shadow of Bollywood’, finally made his way under the spotlight. He made a super-successful commercial film with a big star at the helm. Airlift changed the definition of Raja Krishna Menon. He is now a successful commercial filmmaker. Clearly, the universe conspired to make things happen for him. Today, everybody is celebrating the success of Menon and the fact that he came from nowhere and achieved the benchmark of crafting a 100-crore film. The director (according to reports) is now being courted by lusty producers who are loosening their purse strings for him. It is said that in Bollywood, nobody remembers their dark days of depression, frustration and tears. It is said that when filmmakers taste blood, they become hungry for even more. The lure of creating 100-crore films are such that filmmakers forget about filmmaking and start creating ‘products’. Will Raja Menon turn to be another such filmmaker? Well, we will have to wait for his next film to answer the question.